Waterproof, rustproof, dirtproof. Engineered to repel water and remove solid contaminants before they can damage precision engine components. Racor Aquabloc elements are available in different lengths for various flow rates and color coded for 2, 10 and 30 microns. The lower the micron rating, the finer the filtration. 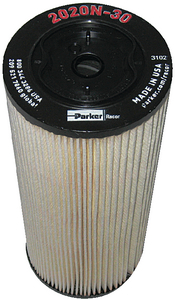 Follow your engine manufacturer's recommendation for fuel filter micron rating.